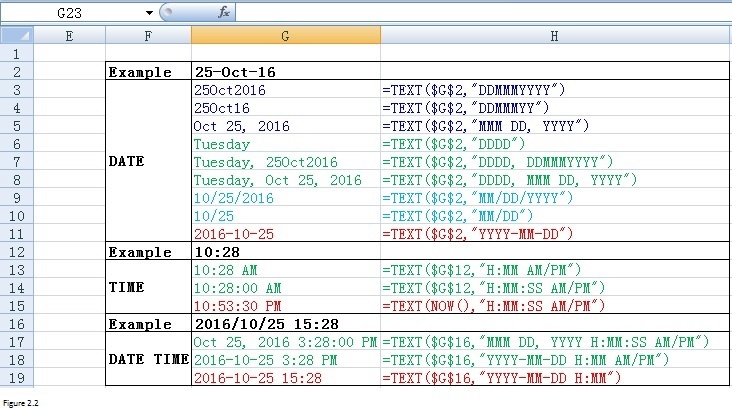 In this article, you will learn how to use Excel format function and text function with 68 examples. These examples will clear your idea about these two functions. Sometimes, we need to format or manipulate data the way what we want. Here is what we generally do. If you right-click on the worksheet, the context menus will be prompted. By clicking on Format Cells in context menus, we can open Format Cells dialog box. From Format Cells dialog box, we can see that the way number, currency, date, time or percentage will be displayed can be changed by making an appropriate selection. However, there are other methods that are available. Today I will show you how to format convert number, date, time, currency and so on using two functions: TEXT function and Format function. TEXT function is a worksheet function which you can use in worksheet while Format function can only be used in VBA code. 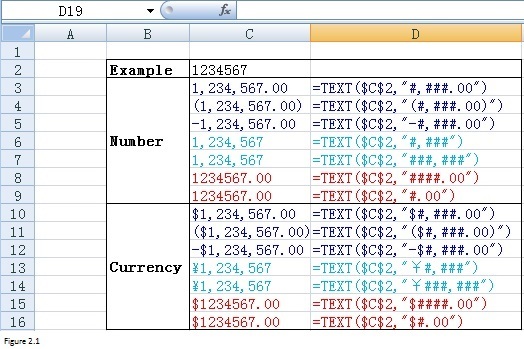 Figure 2.1 shows how to use TEXT function to format number or currency. Values in range C3:C16 are the results returned from formula listed in range D3:D16. From cells C3 through D5, we can not only add a separator or minus sign into number but also put number into parentheses. Plus, we can also determine decimal places. Range C6:D7 tells that format “#,###” is enough to enable us to add a thousand separator. It is not necessary to use a format such as “###,###”. Format “#” can be used when you don’t want to display thousand separators per range C8:D9. Range C10:d16 shows how to display currency. “$” is for dollar while “￥” is for Yuan which is the currency for China. You can use other currency symbols too as long as you put them at the beginning of the format. Range G3:H11 in Figure 2.2 shows how to format date. And you can see that there are a lot of ways to display the date as you wish. Range G13:H15 shows how to format time. Sometimes, we may need to display date and time together. Range G17:H19 presents three ways to format DateTime value. In fact, all combinations of date format (in G3:H11) and time format (in G13:H15) can be used to format DateTime value. You can try by yourself. 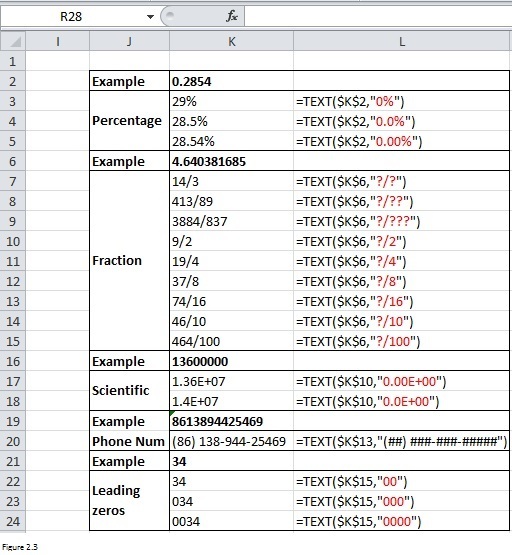 From Figure 1, we can see that TEXT function can also be used to format fraction, percentage, scientific number, etc. For example, range K2:L5 shows that 0.2854 can be displayed with a percent symbol. And you can even determine the number of decimal places by applying TEXT function. As for fraction, range K7:L9 shows that you can determine the number of digits in the numerator. You can even determine what the numerator is per cells from K10 through L15. Range K16:L20 presents you how to format scientific number or telephone number. The last point that I want to show you is how to add leading zeros. If our test number in cell K21 is 340 instead of 34, the number in cell K24 will be “0340”. FORMAT function is a VBA function which you can use in macro code. I have to remind you that FORMAT function cannot be used in the worksheet and you should always enter it into Visual Basic Editor when using it. The syntax for FORMAT function is similar to that for TEXT function. But the format here is fixed. It is not as flexible as that for TEXT function. Below table shows you the format and the corresponding explanation. Percent Displays a percent value – that is, a number multiplied by 100 with a percent sign. Displays two digits to the right of the decimal place. True/False Displays False if the number is 0. Displays True if the number is not 0. Here shows you how to use FORMAT function in VBA. Cells(2, 7) = "Sep 3, 2003"
Column C shows results returned by FORMAT function in column D. Similarly, column G presents what returned by FORMAT function in column H. Values in cells C12 through C14 will be the same as that in Figure 3 as long as the value in cell C11 does not equal to 0. This is inconsistent with the explanations in above table. You can have a try on your own. FORMAT function cannot be applied in worksheet and TEXT function cannot be used in VBA. Figure 4 illustrates that something like “#NAME?” will be returned if you apply FORMAT function in a worksheet. And Excel will give you a prompted message like “Sub or function not defined” if you use TEXT function in VBA. Good day. Is it right that once I put a number or date in a Text format, I am unable to calculate with it ? Let’s say I have a problem within an existing sheet or workbook and try to ask you for a solution by texting you (f.e. in this comment space). This might be unconvincing for you, because, either I don’t know how to formulate my problem or you can’t see the building of my sheet/formulas etc. Is there a way to send you example files, where you can go through and see where I made a ridiculous mistake and you have the power to help me with your immense knowledge ? WHOW. I see you reacted to my former post for the possibility to download your posts as PDF for later evaluation. Thanks a lot for this unique opportunity. I like your posts very much, compared to other, similar newsletters, this is the easiest to handle.